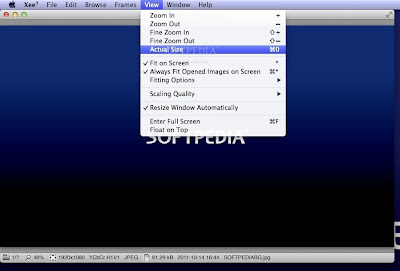 Xee ³ is a direct competitor to preview the visualization software integrated with OS X. Though it is paid, this utility does not lack arguments against Apple's pictures tool. Trackpad users can easily move from one image to another in the same folder, which can be useful for reading a comic book, for example. In this regard, the software can extract photos from an archive to display without having to decompress the archive in question. Compatible with all picture formats, Xee ³ knows to display all the information that can be expected for each image and offers some thoughtful features, such as the export which allows you to select a folder already used up very quickly. For moving images, such as GIF or some famous WebP files, the software not only offers preview, view all images used in animation, he also plays the file in its interface. According to its designer, this tool is better at resizing images on the fly and that more systematically exploits the graphics card to speed up operations. In addition to its many gestures, Xee ³ can also count on a flurry of keyboard shortcuts set as desired in its settings. Xee ³ is a new version of this utility which is quite old, after major update, a complete solution that pays for all users. If you want to find out, you can use the demo version available on the website of the publisher and even buy that version for the same price as the Mac App Store. The advantage of this version is not to be subject to the constraints of sandboxing and thus be more flexible, especially to see all pictures from any folder. To add that its previous version of the software is always available free here. It does not contain the new Xee ³ including printing.